Her March Madness: 2 commercials booked in one month! Since she started "Starter Reality Star" for DT, actress Jess Garvey (C'09) is making some great strides. In her last episode, Jess told us about a national commercial she booked. and watch the commercials she appears in (and find out how she and her Penn boyfriend, Matt Ritter (L'02) got cast together in one of the commercials)! 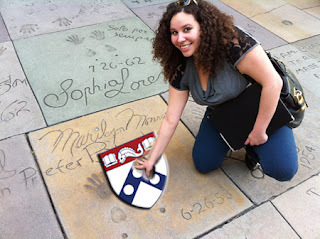 A couple weeks ago, during her spring break, I met with Chloe Castellon (C'11), a senior about to graduate from Penn looking for advice on how to navigate through the Hollywood job market using Penn alumni. After the jump, take a lesson from Chloe and find out how she scored 50 meetings with some of the most successful Penn alumni in the industry. on all sorts of great "lists". Today I have 3 Penn alumni you should know about who have made it onto some great Hollywood Reporter ("THR") power lists. Today one alum ranked as #33 today on "Reality Power List" and the other two (who I haven't covered on DT in the past) were on last year's "Next Generation Young Guns" list. After the jump find out who these moguls are. We've got another Penn alum to add to my growing Penn alumni on commercials list. After the jump check out Juan E. Alva's (W'92, ENG'92, Wharton Undergrad Dean's Advisory Board) appearance in a Porsche commercial and find out why he was selected. 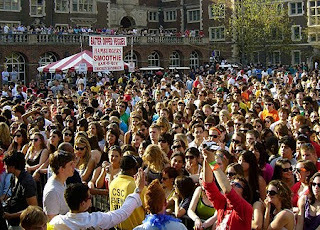 Alcohol permitted at Spring Fling. Uh huh. What do you think? What was the best April Fools Day story you remember being published in the DP? Comment below! Last week, Penn alum Elizabeth Banks (C'96) shared some very personal news with the world. She and husband Max Handelman (C'95, AEPi) welcomed new baby, Felix Handelman (C'39?) into the world. Mazel Tov Liz and Max! In our ongoing "Kelly on Campus" series, campus correspondent Kelly Diamond (C'13) musters up some quick "15 second clips" of events and experiences around Penn's campus. Last we heard from Kelly, she reminded us all of an annoying Van Pelt practice every student who has gone to Penn in past few decades has gone through. After the jump, find out how one Penn professor has given students an "entertaining" reason to attend class.